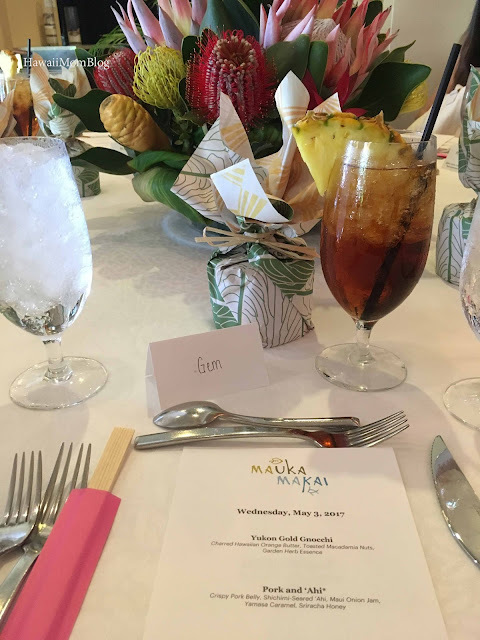 Yesterday I visited The Royal Hawaiian, a Luxury Collection Resort, to attend a pop-up lunch featuring Mauka Makai, the signature restaurant at Maui's newest resort, The Westin Nanea Ocean Villas. 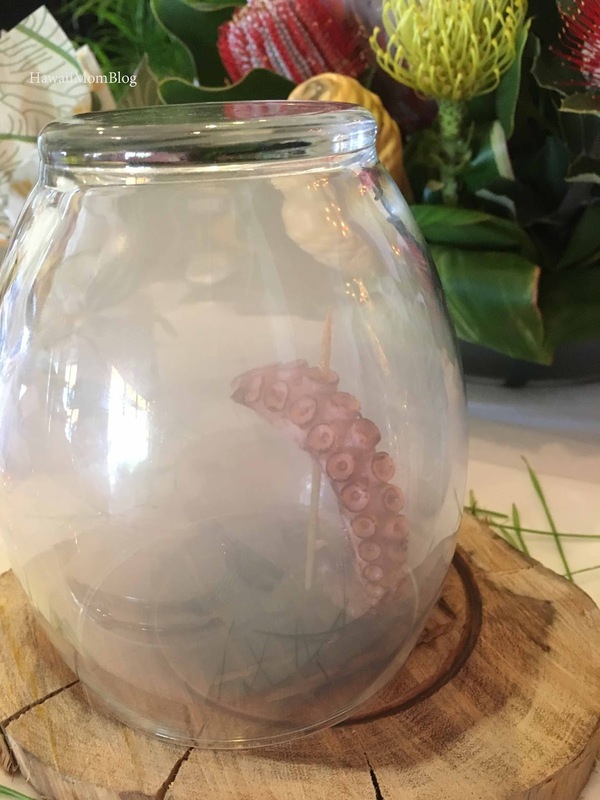 At the lunch, Executive Chef Ikaika Manaku showcased a few culinary creations inspired by ancient Hawaii's farming and fishing traditions (Mauka means toward the mountains; makai means toward the sea), with an emphasis on the use of local products. 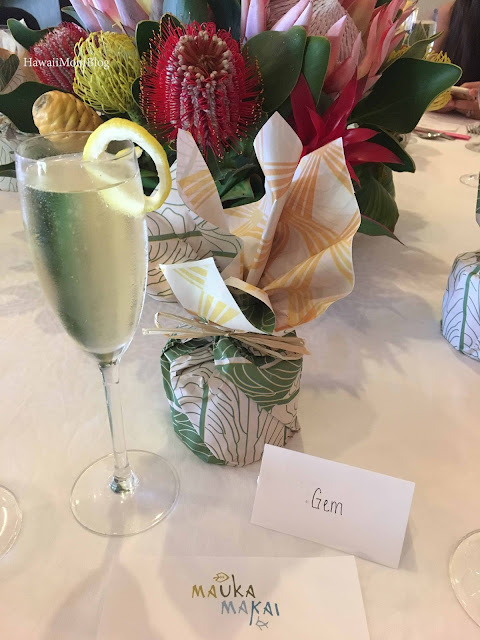 The Gnocchi was a wonderful way to start the tasting. I wish I had a bigger bowl of the gnocchi, which were pillow-soft, yet rich in flavor. 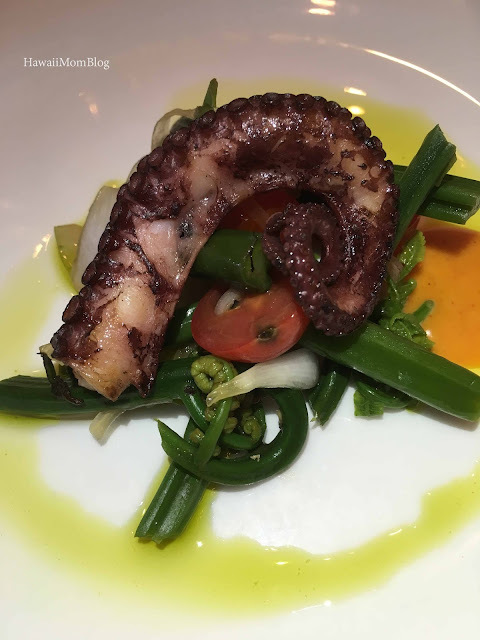 I liked the addition of the macadamia nuts, which added a nice contrasting texture to the dish. 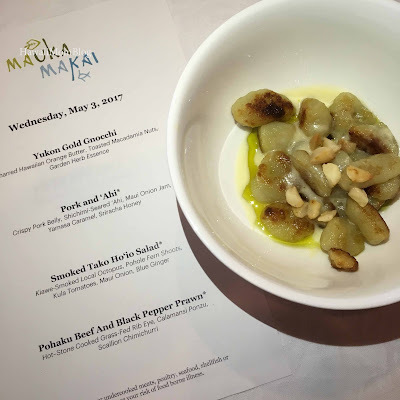 The Pork and `Ahi (plated with a symbolic "piko," which is often used in Hawaiian culture to represent a connection between the past and future) was a crowd-pleaser. 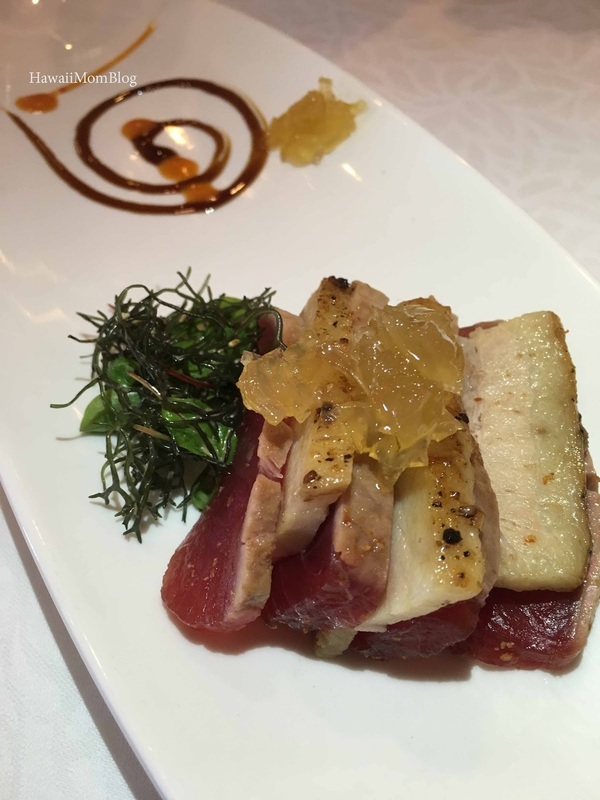 I heard so many people comment on how tender the pork was, and how fresh the ahi was, but most of the comments centered around the Maui onion jam, which really elevated the entire dish. The octopus for the Smoked Tako Ho`io Salad was brought-tableside in a glass-topped slab of kiawe wood, and was then placed on a bed of fresh produce. What a presentation! 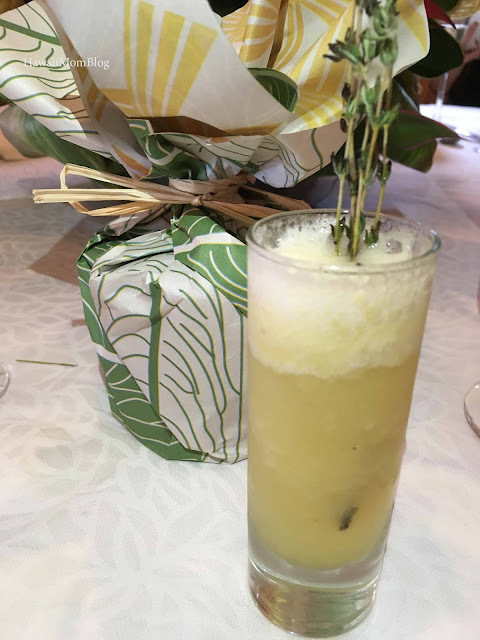 Intermezzo was a refreshing shot of Maui Gold Pineapple and Big Island Vanilla Soda, garnished with Salted Charred Thyme. The Pohaku Beef was served on a hot stone, allowing guests to cook the meat to the desired doneness. 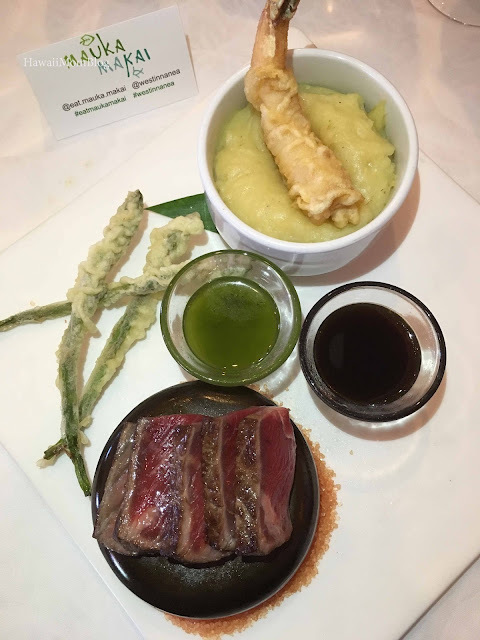 The tempura Prawn was delicious! 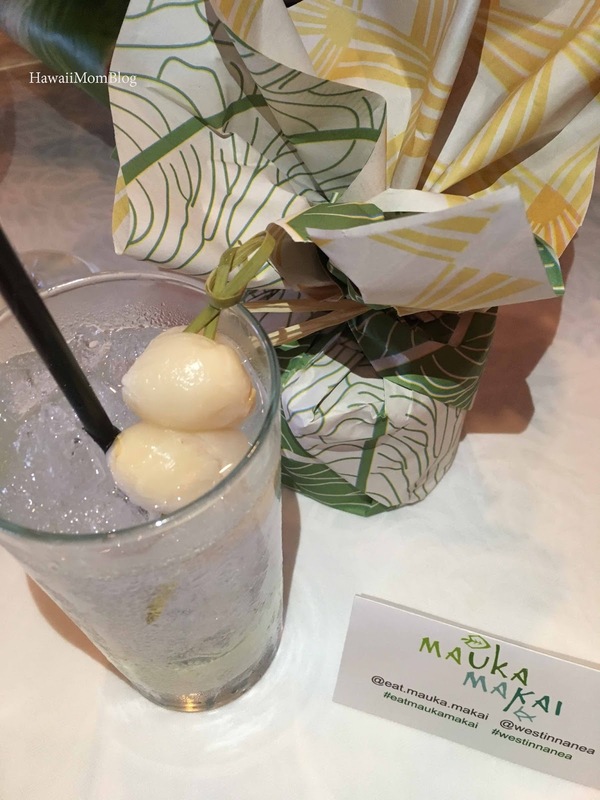 I can't wait to visit the restaurant on Maui for the complete Mauka Makai experience! 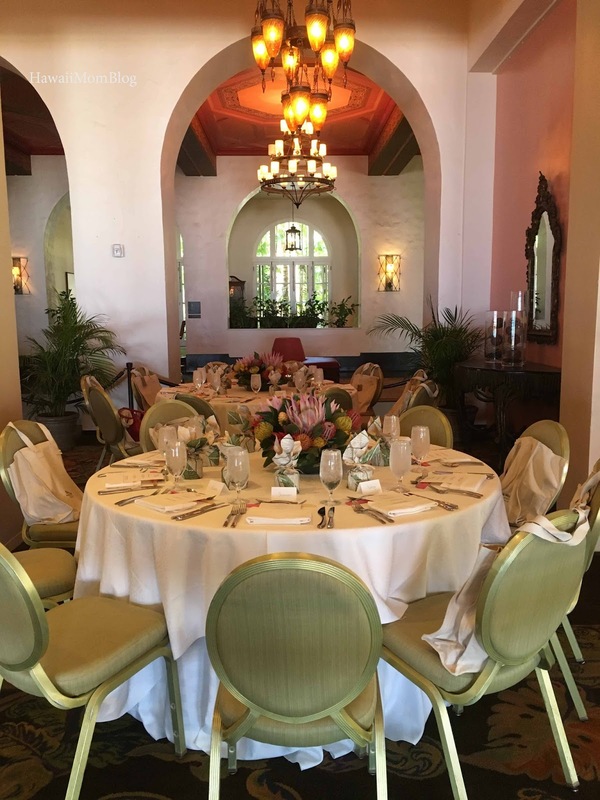 For more information on The Westin Nanea Ocean Villas or Mauka Makai, click here. Situated on Maui’s North Kā‘anapali Beach, The Westin Nanea Ocean Villas is designed to provide a relaxing haven complete with culturally inspired programs and authentic Hawaiian experiences. Every feature of the resort — from the Pu‘uhonua o Nanea Cultural Center to the locally sourced art — celebrates native culture and traditions. The Westin Nanea Ocean Villas offers world-class amenities including an expansive lagoon-style pool, full-service restaurant, beach bar and a WestinWORKOUT® Fitness Studio. All villas offer many of the key amenities of home, combined with signature Westin® touches, such as the Westin Heavenly® Bed and Westin Heavenly® Bath. Villas also feature fully equipped kitchens and washers and dryers.